Lady Cardinals win 1st state cross country title in program history! 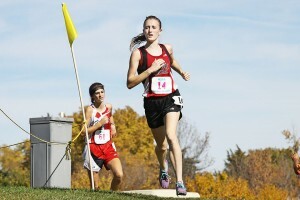 Friday’s weather was unseasonably warm at the 2014 Nebraska State Cross Country Championships in Kearney. But the high temperatures didn’t come close to matching the degree of excitement felt by Cardinal runners as they won Boone Central/Newman Grove’s first state championship in the sport. The BC/NG girls engaged in a duel against Mid-State Conference rival Wayne for the third straight meet and, with three individual medalists, edged the Blue Devils 43-48 for the Class C girls title. It marked the first state championship in the 38-year career of Cardinal Coach Tom Dickey. “I’ve waited a long time,” Dickey told reporters after the race. “That was a sweet day, it really was. Indeed, Dickey’s excitement was focused on the heroic exploits of his runners. Senior Catherine Weeder, who struggled with the effects of some illness a good part of the season, led BC/NG with an 8th place finish. Junior teammates Taylor Starman and Sheldon Beierman seemed linked for most of the race and earned 12th and 13th place medals, respectively. And senior Kendra Gonzalez scored the vital fourth-runner points despite being in considerable distress around the midrace point. It was a winning combination of talent and heart. The Cardinals needed every stride to edge Wayne. BC/NG had nipped the Blue Devils by one point in the Mid-State Championships in Albion two weeks ago and Wayne retaliated by taking the district title on its home course. That set up quite a rubber match for the big prize. “I thought we could get Wayne at a big meet,” Dickey commented. “Wayne’s top three are really good runners, but we felt we could get the fourth. We ended up having four in (or near) the top 20.